Valentina Del Aguila Vasquez is considered to be the most beautiful woman in the Amazon. She won the Miss Amazon Confraternity beauty pageant in Leticia, in which Brazilians, Colombians, and Peruvians all participate. The first prize includes an envelope with U.S. $1,000, an orthodontic treatment, and cosmetic surgery at a reputable clinic in Bogota. After the meal, the turtle shell becomes a toy for the children. Turtle meat is a favorite dish in the communities along the banks of the Rio Curaray. 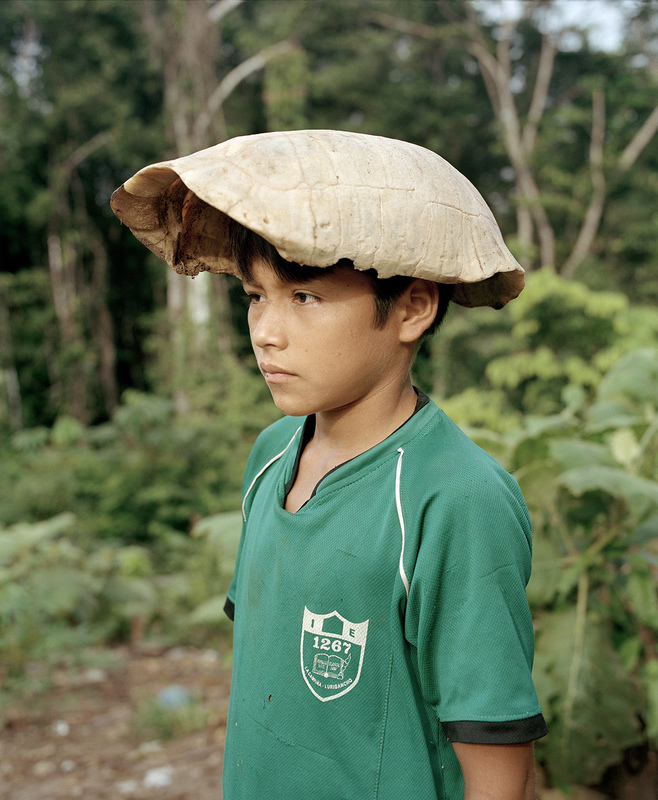 Yann Gross was the winner of the first LUMA Rencontres Dummy Book Award at Arles 2015, and the result was the publication, by Aperture Books, of his first photobook The Jungle Book: Contemporary Stories of the Amazon and its Fringe. 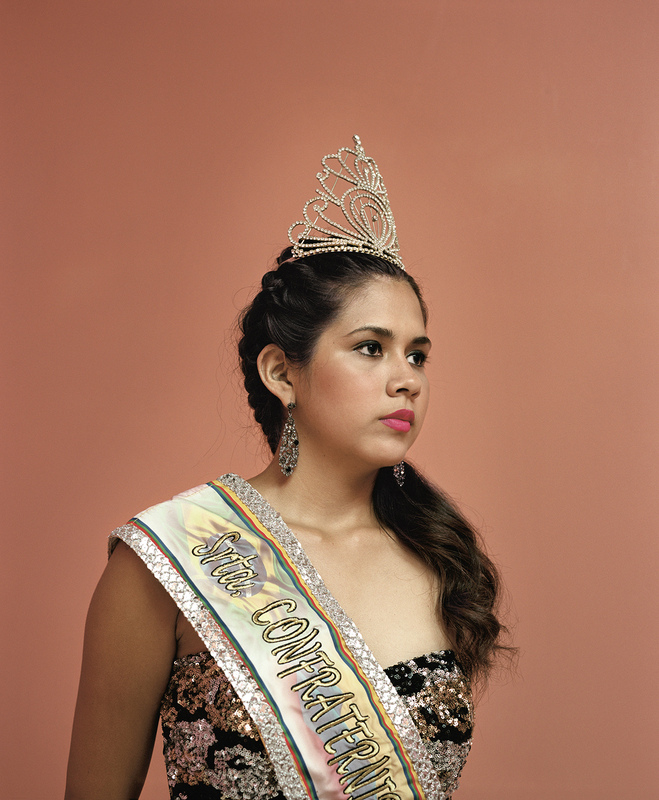 As the title describes, Gross’ photographs explore the clusters of community that spread along the length of the gargantuan South American river. As the introduction of the book explains, the Amazon is an agglomeration of cultures and peoples due to its length and the resulting dispersal: “this land” – the Amazon as monolithic whole – “doesn’t exist.” Gross’ project is witness to the extraordinary breadth of the Amazon’s component parts, the fragments that make up a wide and ever-shifting entity. The first photographs in the book are expansive, unspoilt landscapes, but the industry that surrounds the water soon becomes apparent: the Amazon is a great resource, and it is for this reason that people have flocked to it. Breathtaking images of the jungle are interspersed with quieter, intimate portraits as we are slowly introduced to some of the inhabitants of the Amazon’s fringes. As the book progresses, the river’s disparities become apparent: images of shamans, animal skulls and medicinal barks jostle against images of schools, dentistry, oil drilling. Indigenous culture is still deeply rooted, while the modern world is decidedly present, too. The Amazon seems to run the full gamut from old to new, and usually within spitting distance of one another. Often the world Gross presents is strikingly unfamiliar. A man called Hitler feels he has a strong name, despite knowing who Hitler was; another woman names her daughter Ampicilina, after an antibiotic; the cultural import of words unravels and begins to lose its meaning here. Cocaine is hidden in Coke cans, beauty pageant finalists are awarded with plastic surgery, assassination is heralded by a phone call. Gross’ rendering of the Amazon evokes South American magical realism at the same time as it renders it completely plausible, even banal. His careful, steady composition and clean visual presentation of his subjects allows us to observe at length, not rushing any conclusions from the viewer. Perhaps the only thing missing from the book is sound. Gross gives a visual sense of the bustling noise of the Amazon and its environs, yet our experience of looking at the photographs is necessarily silent. A tranquil, hazy photograph of a misty waterscape in cool violet tones, towards the beginning of the book, is captioned with the contradictory: “I only heard one thing: the blaring sound of their techno music”. Gross seems to be hinting at the impossibility of translating this aspect via pictures, instead leaving the experience of the river to happen quietly and internally within the viewer. This is the Amazon at a distance: catalogued, tidied and silenced. The book itself is beautifully bound, with matte pages and gilt edges, making it a pleasure to read and explore. It comes complete with an illustrated map of the Amazon that can be pulled out and unfolded. The Jungle Book has an acute sense of visual pacing, with blank pages interspersed opportunely amongst large images at full bleed that appear as the book progresses; the reader is carried along as if by the river itself. Gross’ work is escapism with a realist edge: the beauties and uglinesses of the Amazon represented with equal care, a beguiling trip into the South American jungle. The Jungle Book: Contemporary Stories of the Amazon and its Fringe is available to buy now from Aperture Books. 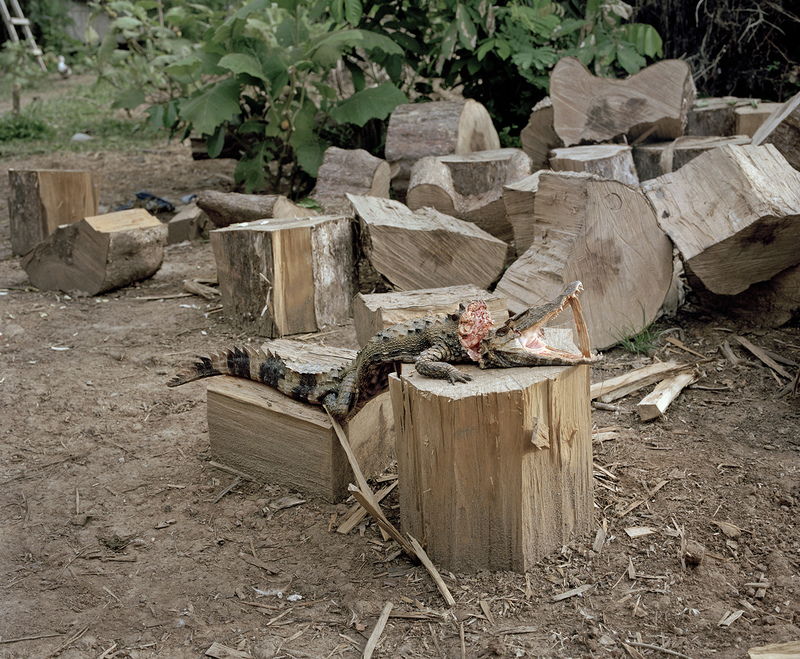 Caiman meat is highly prized. This one will be prepared for lunch. 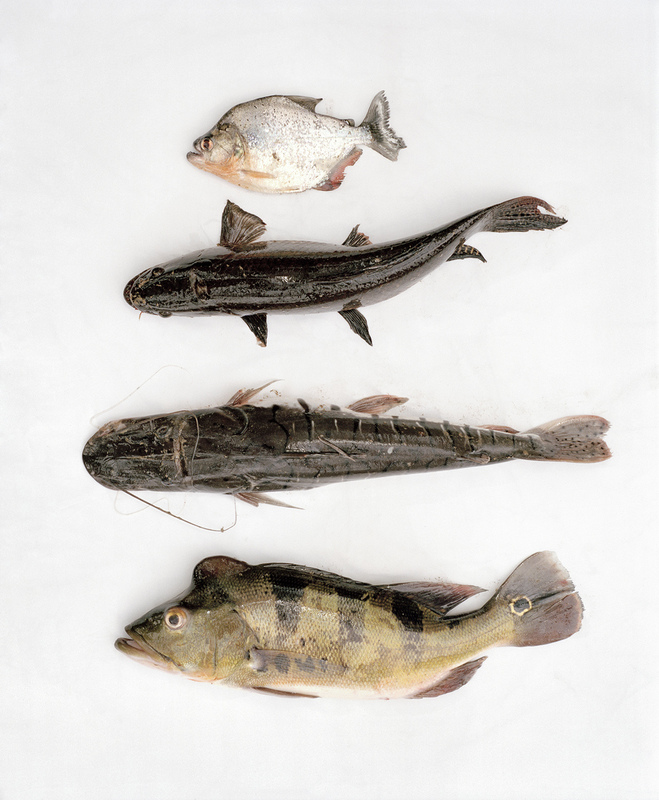 Fish have become rare in the Curaray and Napo rivers and the water contamination makes eating them dangerous. New communities are being established near lagoons that are better protected, and where it is easy to fish for piranhas, fasacos, zungaros, and tucunares. All photographs (C) Yann Gross.